True prayer opens a new dimension in our lives as we receive impartations from our true Self, the full and complete expression of God within. We avoid the inharmonies and discords of human life and climb to the highest altitudes of Spirit, where we see an expanded horizon of life's grandeur and possibilities. Our contact with this infinite Source within brings forth and maintains harmony, beauty, peace, wholeness and completeness, and we live by Grace. With an incomparable blend of spiritual vision and practical advice, Goldsmith explains how we can attain the heights of prayer and the joy of union with our Source. Step by step, he lays out how to prepare for prayer through humility, benevolence, and forgiveness, and by emptying out all material desires and old ideas of prayer. We must also know, he says, that God is the only law and the only power, so that in prayer we do not seek God as a power over some evil. When we fulfill these conditions and make ourselves receptive, we create a vacuum into which the divine Presence can flow and function as our life. As he affirms, "Eventually the day comes when you can say, 'I am not living my own life. I am living, yes, but I am not striving or struggling: Christ is living my life.' Then you are praying the prayer that enables you to be in the inner sanctuary within yourself and there tabernacle with God." Taking the reader through a typical day, Goldsmith shows how to live a life of prayer by beginning and ending the day in recognition of the Presence within, and throughout the day, remaining in an inner stillness and listening attitude even as we go about our daily routine. This is "keeping the mind stayed on God," and "praying without ceasing." Through meditation and prayer, we develop spiritual discernment, and the kingdom of God is revealed from within through spiritual means. 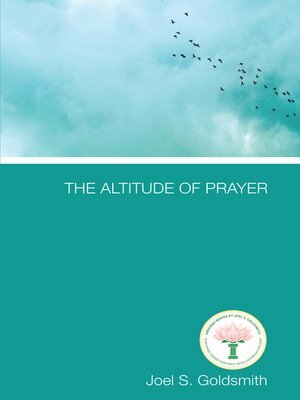 The Altitude of Prayer is Goldsmith's most significant work on the subject of prayer, and will be a great inspiration to anyone who wants to deepen their awareness and appreciation of prayer.